Powered by Real Time Gaming, Jackpot Cash Casino Mobile is one of the latest mobile casinos intended primarily for South Africans. The casino’s tempting name is justified with RTG fair games that include even progressive ones. With yellowish and red background, Jackpot Cash associates to luxury and royal lifestyle. Fans of Real Time Gaming can enjoy the most prominent mobile games by this provider and know for sure that they are spending their time in a fair and safe gaming environment. All the games can be played in practise mode after you register. Real Time Gaming is very popular among South African players which is one of the reasons why casino owners like to use their software when creating new mobile casinos that target players from our country. Another reason, even more important than the previous, is that RTG software runs smoothly on all kinds of mobile devices and never brings bad surprises. Jackpot Cash Casino has, therefore, chosen the right company for their software provider which is extremely important to our players, because they can relax and play without worrying about sudden software malfunctions. We need to point out that Real Time Gaming software is not the only insurance for fair gaming, since this casino games have been evaluated on a regular basis by an outside auditor, iTech Labs. You can find certificates published by this auditor on the casino’s website if you want to make sure yourself that Jackpot Cash Casino Mobile provides fairness of their games. On top of that, all banking transactions are protected by the Secure Socket Layer (SSL), a powerful software technology known for its excellent effects in blocking all potential abusers from stealing information. The game selection can be considered a standard RTG offer which is good enough for many mobile players, especially having in mind that Jackpot Cash Casino Mobile manages to squeeze various games in not so big game lobby. Those mobile players that prefer RTG slots can be sure that they will find their favourite games at any time. Additionally, they will be satisfied with the fact that latest RTG video slots are placed at the lobby soon after they are released. The variety of video slots enables the players to choose the theme they prefer as well as the number of reels and paylines. If you enjoy playing standard 5-reel video slots with excellent visual effects, this casino is definitely a place for you. If you are into progressive games, go and see what Aztec’s Millions progressive video slot has to offer. Although slots take the largest part of the casino’s game library, you will not be deprived of the table games as well. Blackjack can be played in two versions – Blackjack 21 and Shut’em Up Blackjack. Poker funs are treated to Three Card Poker and Double Double Bonus Poker. Like to break slot sessions with some roulette? No problem, Jackpot Cash offers European Roulette to you. The closest you may get to lottery at Jackpot Cash Casino Mobile is by playing their Keno game. Like most other mobile casinos, Jackpot Cash supports playing via all Android and Apple devices. You do not need to download the application to reach the casino’s games; all you need to do is scanning the casino’s QR code and the game lobby will pop up on your screen. Of course, you will need the appropriate browser (Google Chrome, for instance). 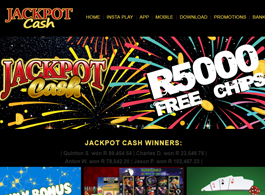 • 4th deposit – 20% signup bonus up to R600. The promotions page is full of various bonus offers that include weekly promotions, cash back promotions, reload bonuses and more. An interesting bonus offer is given to all members who make a deposit using a popular virtual wallet, Skrill – deposit R10,000 and the casino will double it. The wagering requirements are quite generous as well – the welcome bonus + your deposit should be wagered 10 times before making a withdrawal. The players from South Africa have a wide range of banking options at their disposal. Visa and Visa Electron, as well as Master Card are accepted for both, deposits and withdrawals. However, Jackpot Cash Casino Mobile prefers your transactions via Skrill, as we have seen above. Other banking methods include Neteller, Easy EFT, EcoPayz, Secure Instand Deposit, Internet Bank Transfer, but also Bitcoin by Netteler. Needless to say, all transactions can be processed in ZAR. Customer support includes toll free phone number and email communication. There is a nice FAQ section as well as tutorials for the games, but there is no live chat support. Although the casino’s staff will answer your phone calls 24 hours a day, a lack of chat communication is not something Jackpot Cash should be proud of. There are numerous reasons to pick Jackpot Cash Casino Mobile among hundreds of mobile casinos on the web. The main reason could be that this casino welcomes all South Africans and accepts Rand which saves you money and time. Reliable platform powered by Real Time Gaming guarantees feeling the full casino experience on the move, while their games give you fair chances of making wins. Additionally, this mobile casino has very generous and diverse bonuses and promotions to boost your balance under acceptable wagering requirements.